Demand for doctors – whether in person or via a computer screen – is expected to surge as millions more Americans become insured under the Affordable Care Act. About 10 million people already rely on telemedicine, often from doctors who live in another state. As a result, more physicians are applying for medical licenses in multiple states – a costly and time-consuming proposition for some. Without a license to practice medicine in the patient’s state of residence, both doctors and patients may be at legal risk. Many states are embracing telemedicine by encouraging it in their Medicaid programs and requiring private insurers to pay for it. But they have made little progress in removing medical licensing barriers that proponents of the technology say have kept doctors and hospitals from expanding even more. Telemedicine was once the purview of small town doctors who needed to consult with specialists available only in larger urban areas. Today, telemedicine technology is even being used to conduct surgeries using robotics, typically only in emergency situations such as during war. 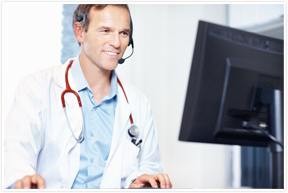 Most telemedicine consists of video teleconferencing between a doctor and a patient. Doctors also routinely use telemedicine technology to transmit and discuss diagnostic images and to remotely monitor patients with chronic diseases so they don’t have to leave their homes or nursing facilities. For some consumers, it is the primary way they receive medical care. Using Skype on a computer or FaceTime on an iPhone, patients discuss their symptoms and show their doctors any visible evidence of their conditions, such as a swollen eye or skin rash. Patients most often conduct these consultations from home or their workplace. In some cases, patients go to a medical facility and use high-end, secure equipment to teleconference with a doctor in another location. Much of the growth in telemedicine is expected to be in remote monitoring of patients with heart and lung diseases and diabetes, who have recently been discharged from a hospital. The aim is to detect health problems early enough to prevent them from being sent back to the hospital. States have argued that easing licensing requirements could jeopardize patient safety. If doctors practice in a state without obtaining a license there, regulators maintain that they have no power to conduct an investigation or explore a consumer complaint. Also, these doctors would not benefit from any legal protections the state may have against malpractice lawsuits. Proponents of telemedicine argue that since doctors take standardized national exams and most requirements are set by federal agencies such as the U.S. Department of Health and Human Services, states should recognize other state licenses. They say state medical boards are simply trying to shield doctors from out-of-state competition and preserve state revenues from licensing fees. 2-hour course required for license renewal of Florida SLPs and Audiologists on December 31, 2011.